Lamp Lighting or The Setting of Lights is an ancient tradition. Sacred lamps, oils, and lights have been used and recorded throughout history for thousands of years. They are also one of the oldest Hoodoo arts, and sadly, they are all but forgotten. But NOT at Conjured Cardea! 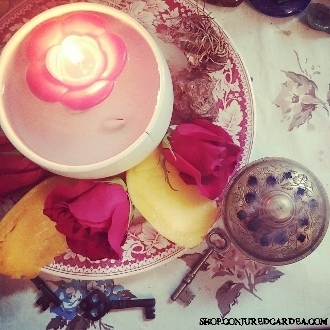 Lamp lighting is one of my favorite offerings and perform them regularly for each Orisha and on the behalf of clients. This listing is for a 2 ounce glass REFILL bottle of oil for your lamp. PLEASE ENTER YOUR GOAL OR OIL CHOICE in the "Special Instructions" area on your order page so I can create the oil you want for your lamp. Thanks for looking! curio only.